In-ear monitoring is usually considered to be an expensive luxury by those of us lower down the live-sound food chain: there's the expense of getting custom ear moulds made, and many will use a wireless system to feed the signal. Does it need to be so expensive, though? The wireless system is something of a luxury, and if you happen to be playing a wired instrument such as a guitar, an extra wire feed to your earphones isn't going to impede your movement much further. As for those expensive ear moulds, in my own experience, custom moulded models are necessary if you demand the highest possible isolation from external sounds. If you can live with a little bit of leakage, however, universal in-ear monitors like the Prodipe IEM3s may be worth a try. Supplied with a circular, zip-up storage pouch, the IEM3s look similar to the type of ear bud you might use with your MP3 player, using a soft rubber grommet to seal the business end of the phone into your ear. As ears come in a variety of sizes, three sets of differently sized grommets are included so you can find the one that fits best. Once you've found the best size for your own ears, the rejection of external noise is significant, though still not nearly as good as with custom ear moulds. The manufacturer's literature claims almost total isolation from outside sounds, but this will differ depending on how well the phones fit. I always have problems with these fittings, so I didn't get much isolation at all, but don't let that put you off trying them yourself. There's always the option of wearing a stylish bandanna over your ears if you need more isolation, and there are various third-party and after-market tips that can help. Most ear buds seem to make it their mission to become as tangled as possible between uses, but the rubbery cable insulation on the IEM3 actually seems to make them want to untangle themselves, which is a definite plus point. The 1.2m cord terminates in the usual 3.5mm miniature stereo jack, which is long enough if you use a belt-mounted headphone amp or radio receiver, otherwise an extension cable will be required. The drivers themselves have been chosen for their wide, flat frequency response, quoted in the manual as 10Hz to 22kHz. Their impedance is 16Ω and sensitivity is 95dB/mW, so you don't need much power at all to get very high SPLs from these phones. As with most in-ear monitoring systems, using a headphone amp with an output-level limiter would be a wise precaution, to prevent accidental exposure to damaging sound levels. When it comes to isolation from outside noises, your mileage may vary depending on the shape of your ears but, as I mentioned earlier, sonically speaking the phones are clear and more than adequately loud. Unless you can get them to fit really well, the sound tends to lack a little low end, but then so much bottom end tends to come through from the main PA in any case that this is unlikely to be a problem. My main concern with this model is the reduced amount of isolation that can be achieved compared to custom moulds: the less isolation you have, the louder you need to monitor to overcome the sound of the band. Loud monitoring can be dangerous and can lead to ear damage. Still, as a low-cost way of finding out whether in-ear monitoring is for you, this model is well worth trying. You may well find that in your own ears, or with different tips, they offer adequate isolation without the expense of custom moulds. If not, they'll make perfectly good earphones for your MP3 player, so they won't be wasted! High volume and reasonably flat response. Low cost way to try in-ear monitoring. Isolation level is lower than custom moulds, and varies from ear to ear. 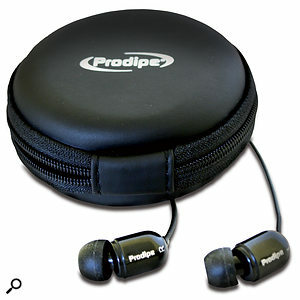 These affordable in-ear monitors are similar to many consumer products, but have been designed to play loudly and cleanly. How effectively the rubber grommets isolate you from outside sound depends very much on the shape of your ear canal.